Digital advertising is increasingly gaining ground in companies. There are sectors that are almost nonexistent outside of the online environment, such as travel and hotel reservations or viewing of movies and series. But what kind of ad is the best to invest in? What types are there? 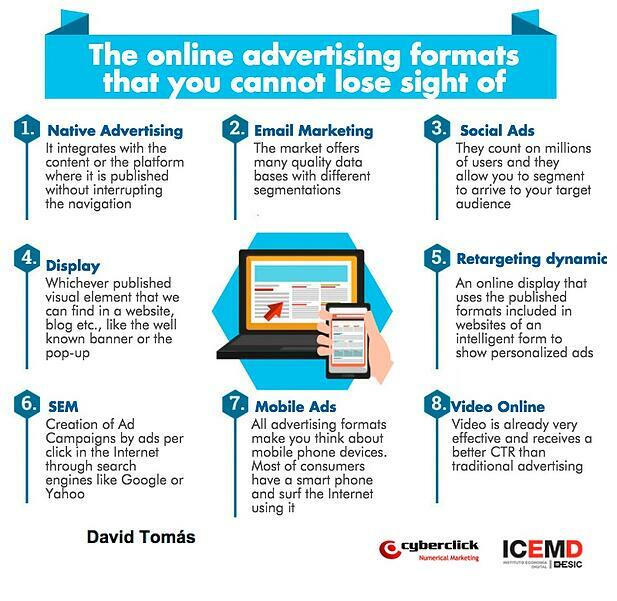 From one marketer to another, to cast some light on the matter, here I leave 8 digital advertising formats that you must not lose sight of. While some of the concepts that I propose are not a format in itself, but a collection of them, I wanted to highlight those that tower above the rest. Advertising on social networks, making video ads or opting for all your content advertising to be responsive so they are adapted to mobile devices is imperative in any digital marketing and advertising strategy. Remember, always bet on formats that are noninvasive, so the impact on the consumer is positive and obtains the best results from your advertisement investment.